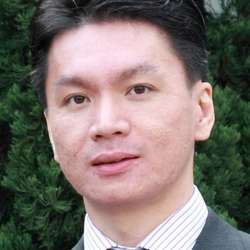 Chung-Shue (Calvin) Chen is a Member of Technical Staff (Research Scientist) at Nokia Bell Labs. He also holds a position of Permanent Member (Researcher) at Laboratory of Information, Networking and Communication Sciences (LINCS), in Paris. Prior to joining Bell Labs, he worked at INRIA, in the research group on Network Theory and Communications (TREC). He was an ERCIM Alain Bensoussan Fellow at the Norwegian University of Science and Technology (NTNU), Norway, and the National Center for Mathematics and Computer Science (CWI), The Netherlands. He was an Assistant Professor at The Chinese University of Hong Kong. Calvin has served as TPC in international conferences including ICC, Globecom, WCNC, PIMRC, VTC, CCNC and WiOpt. He is an Editor of European Trans. on Telecommunications (ETT). He is an IEEE Senior Member. His research spans a wide range of topics in wireless networks, information and communication systems, resource allocation, optimization, and intelligent systems. Thanks to KS, his Erdös number is 3. L. Salaun, M. Coupechoux, and C. S. Chen, "Weighted Sum-Rate Maximization in Multi-Carrier NOMA with Cellular Power Constraint," IEEE International Conference on Computer Communications (INFOCOM), 2019. Y. Li, C. S. Chen, and W. S. Wong, "Power Control for Multi-sensor Remote State Estimation over Interference Channel," Elsevier Systems and Control Letters, 2019. Y. Li, Y. Chen, C. S. Chen, Z. Wang, and Y.-H. Zhu, "Simultaneous Sensor Placement and Scheduling for Fusion-Based Detection in RF-Powered Sensor Networks," IEEE Internet of Things Journal (IoT), 2019. Y. Fu, L. Salaun, C. W. Sung, and C. S. Chen, "Subcarrier and Power Allocation for the Downlink of Multicarrier NOMA Systems," IEEE Transactions on Vehicular Technology (TVT), 2018. Y. Li, Y. Chen, C. S. Chen, Z. Wang, and Y.-H. Zhu, "Charging While Moving: Deploying Wireless Chargers for Powering Wearable Devices," IEEE Transactions on Vehicular Technology (TVT), 2018. Y. Li, C. S. Chen, K. Chi, and J. Zhang, "Two-tiered relay node placement for WSN-based home health monitoring system," Springer Journal on Peer-to-Peer Networking and Applications (P2PNA), 2018. Y. Liu, C. S. Chen, C. W. Sung, and C. Singh, "A Game Theoretic Distributed Algorithm for FeICIC Optimization in LTE-A HetNets," IEEE/ACM Transactions on Networking (TON), 2017. D. Boviz, C. S. Chen, and S. Yang, "Effective Design of Multi-user Reception and Fronthaul Rate Allocation in 5G Cloud-RAN," IEEE Journal on Selected Areas in Communications (JSAC), 2017. N. Trabelsi, C. S. Chen, L. Roullet, E. Altman, and R. El Azouzi, "User Association and Resource Allocation Optimization in LTE Cellular Networks," IEEE Transactions on Network and Service Management (TNSM), 2017. A. Nuwanpriya, S.-W. Ho, and C. S. Chen, "Indoor MIMO Visible Light Communications: Novel Angle Diversity Receivers for Mobile Users," IEEE Journal on Selected Areas in Communications (JSAC), 2015. S.-W. Ho, J. Duan, and C. S. Chen, "Location-based information transmission systems using visible light communications," Transactions on Emerging Telecommunications Technologies (ETT), 2015. V. Garcia, C. S. Chen, Y. Zhou, and J. Shi, "Gibbs Sampling Based Distributed OFDMA Resource Allocation," Science China - Information Sciences, Springer, 2014. I-H. Hou and C. S. Chen, "An energy-aware protocol for self-organizing heterogeneous LTE systems," IEEE Journal on Selected Areas in Communications, 2013. V. M. Nguyen, C. S. Chen, and L. Thomas, "A unified stochastic model of handover measurement in mobile networks," IEEE/ACM Transactions on Networking, 2013. J. A. Zhang, I. B. Collings, C. S. Chen, L. Roullet, L. Luo, S.-W. Ho, and J. Yuan, "Evolving small-cell communications towards mobile-over-FTTx networks", IEEE Communications Magazine, 2013. J. Ling, D. Chizhik, C. S. Chen, and R. Valenzuela, "Capacity growth of heterogeneous cellular networks," Bell Labs Technical Journal, 2013. C. S. Chen and F. Baccelli, "Gibbsian method for the self-optimization of cellular networks," EURASIP Journal on Wireless Communications and Networking, 2012. C. S. Chen, K. S. Shum, and C. W. Sung, "Round-robin power control for the weighted sum rate maximization of wireless networks over multiple interfering links," European Transactions on Telecommunications (ETT), 2011. V. M. Nguyen, F. Baccelli, L. Thomas, and C. S. Chen, "Best signal quality in cellular networks: asymptotic properties and applications to mobility management in small cell networks," EURASIP Journal on Wireless Communications and Networking, 2010. K. Shum, W. S. Wong, and C. S. Chen, "A general upper bound on the size of constant-weight conflict-avoiding codes," IEEE Transactions on Information Theory, 2010. Y. Li, C. S. Chen, Y.-Q. Song, Z. Wang, and Y. Sun, "Enhancing real-time delivery for wireless sensor networks with two-hop information," IEEE Transactions on Industrial Informatics, 2009. K. Shum, C. S. Chen, C. W. Sung, and W. S. Wong, "Shift-invariant protocol sequences for the collision channel without feedback," IEEE Transactions on Information Theory, 2009. C. S. Chen, W. S. Wong, and Y.-Q. Song, "Constructions of robust protocol sequences for wireless sensor and ad hoc networks," IEEE Transactions on Vehicular Technology, 2008. H. Zhang, C. S. Chen, and W. S. Wong, "Distributed power control for time-varying systems: performance and convergence analysis," IEEE Transactions on Vehicular Technology, 2005. C. S. Chen and W. S. Wong, "Bandwidth allocation for wireless multimedia systems with most regular sequences," IEEE Transactions on Wireless Communications, 2005.